Follow this link to learn more about Brugada syndrome and the ECG patterns they manifest by one of ISE's Masters Prof. Carlos Alberto Pastore, MD, PhD, FESC and his colleague, Dr. Nelson Samesima, MD, PhD Clinical Unit of Electrocardiography. Both are from the Heart Institute (InCor) – Hospital das Clínicas da Faculdade de Medicina, Universidade de São Paulo, Brazil. 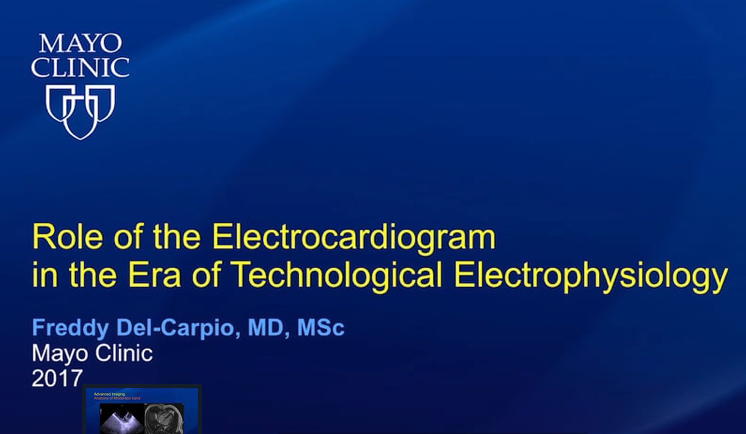 What role does the ECG still play in this modern era of hghly technical electrophysiology? Cardiologists have access to catheter based mapping and imaging techniques so is the ECG still relevant? Dr. Del-Carpio from the Mayo Clinic provides this video in response to these questions. He summarizes some brief history of the ECG and then outlines the may roles the ECG still plays in modern EP. "An EKG is worth a thousand words" is his motto as he describes a series of cases in which the ECG can guide the cardiologist at all phases of the initial diagnosis through post ablation followup.